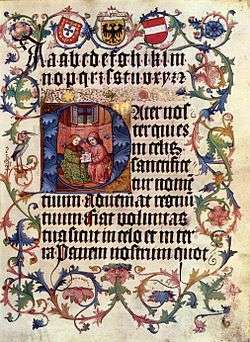 The Lord's Prayer, in Matthew 6:9, 1500, Vienna. Matthew 6 is the sixth chapter of the Gospel of Matthew in the New Testament. This chapter contains the middle portion of the Sermon on the Mount. It includes the Lord's Prayer. The first part, in Matthew 6:1-18 deals with the outward and inward expression of piety, referring to almsgiving, private prayer and fasting. This part of the chapter goes over the three most important outward expressions of Jewish piety, alms giving, prayer, and fasting. Jesus endorses the standard teachings that these acts are important. Throughout this section he stresses that worship and piety should not be ostentatious, and ideally should be done in secret. He strongly condemns those who make public displays of their piety, stating that those who are pious to impress others will only impress people, and will do nothing to impress God. Matthew 6:19-34 deals with possessions and the issues of priorities and trust. The first part in Matthew 6:19-24 has three elements about two treasures, two eyes and two masters. The second part in Matthew 6:25-34 deals with trust in God and also has three elements and provides reasons for not being anxious. 2Therefore, when thou doest [thine] alms, do not sound a trumpet before thee, as the hypocrites do in the synagogues and in the streets, that they may have glory of men. Verily I say unto you, They have their reward. 5And when thou prayest, thou shalt not be as the hypocrites [are]: for they love to pray standing in the synagogues and in the corners of the streets, that they may be seen of men. Verily I say unto you, They have their reward. 7But when ye pray, use not vain repetitions, as the heathen [do]: for they think that they shall be heard for their much speaking. 10Thy kingdom come. Thy will be done in earth, as [it is] in heaven. 16Moreover, when ye fast, be not, as the hypocrites, of a sad countenance: for they disfigure their faces, that they may appear unto men to fast. Verily I say unto you, They have their reward. 18That thou appear not unto men to fast, but unto thy Father which is in secret: and thy Father, which seeth in secret, shall reward thee openly. 22The light of the body is the eye: if therefore thine eye be single, thy whole body shall be full of light. 23But if thine eye be evil, thy whole body shall be full of darkness. If therefore the light that is in thee be darkness, how great [is] that darkness! 25Therefore, I say unto you, Take no thought for your life, what ye shall eat, or what ye shall drink; nor yet for your body, what ye shall put on. Is not the life more than meat, and the body than raiment? 30 Wherefore, if God so clothe the grass of the field, which to day is, and to morrow is cast into the oven, [shall he] not much more [clothe] you, O ye of little faith? 31Therefore, take no thought, saying, What shall we eat? or, What shall we drink? or, Wherewithal shall we be clothed? 34Take therefore no thought for the morrow: for the morrow shall take thought for the things of itself. Sufficient unto the day [is] the evil thereof. Wikimedia Commons has media related to Gospel of Matthew - Chapter 6.